During the trip, the kids started referring to Plattekill as “Little Jay.” They might be onto something. Who is Bill Stenger’s partner anyway? Matthew, Nick and I skied tree lines all morning. Danielle skied the trails and met us at the bottom of the lift (she’s wasn’t really into the trees). In the afternoon, Danielle and Nick retreated to the Ice Haus arena for another three-hour session of sticks and pucks. Nick loves hockey as much as skiing, and Danielle said it was nice to get into a cool building because it was getting hot outside. 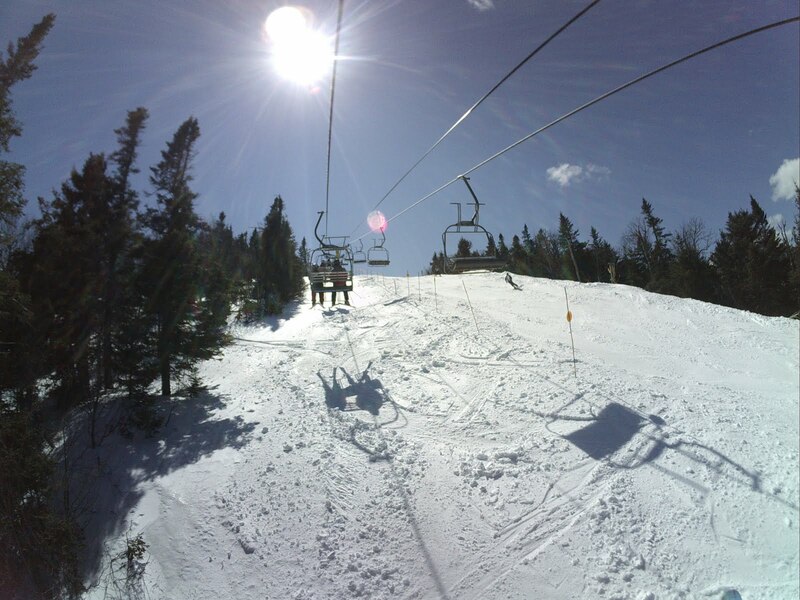 Matthew and I headed over to Stateside, stripped off our windbreakers, hung them on the lift corral with a hundred or so other coats, and skied the next three hours in one layer and kept reapplying the sunscreen as Mama had ordered. 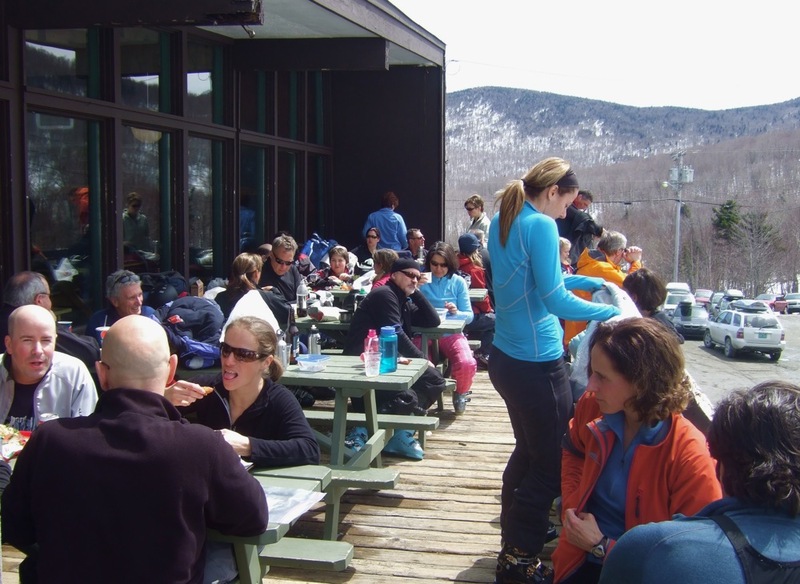 Four runs later and after launching some big air in the terrain park, we decided to grab some lunch at Stateside. 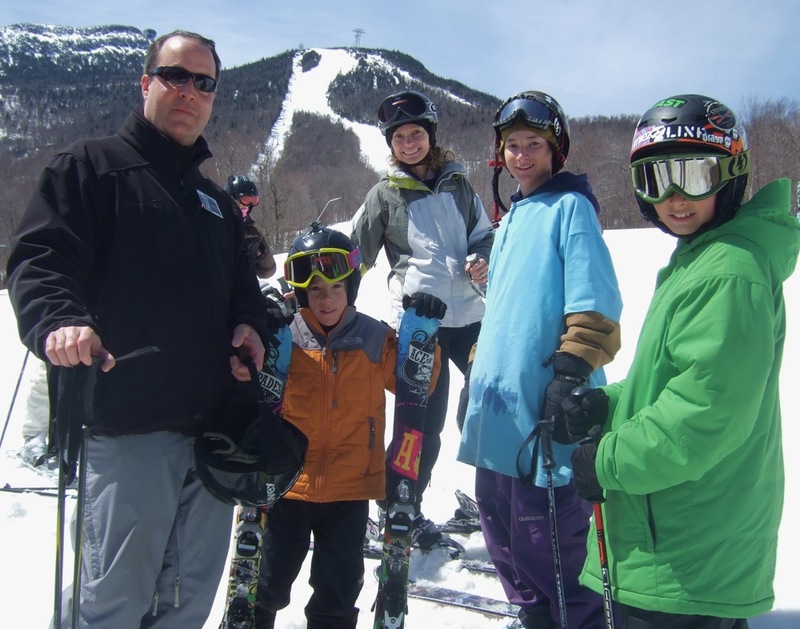 Matthew swore he heard someone say “That’s Laz from Plattekill!” It was a regular Platty family who hadn’t been around this year because they have a son who is enrolled at Stowe ski academy. The Brown family with two dogs always in tow, Sonny and Cher, whom they always walked at lunch and at the end of the day at Platty. They admitted they missed Plattekill, and Dad confessed that he visits our website every day to see what’s going on. They regret missing this year — our snow was as good as any in the east this season. I’m sure he’ll be checking Harvey Road on Monday from the office, and I’m hoping to get their business back. They still own their Catskill home. Maybe it’s a sign, a subconscious decision not to sell knowing they’ll be back. 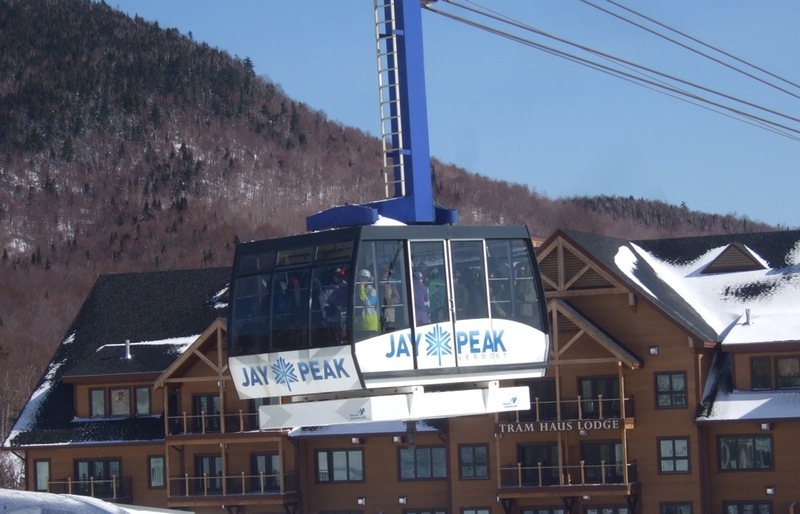 I hope the same goes for the another family we met at the top of the tram taking pictures, wearing the Plattekill logo. 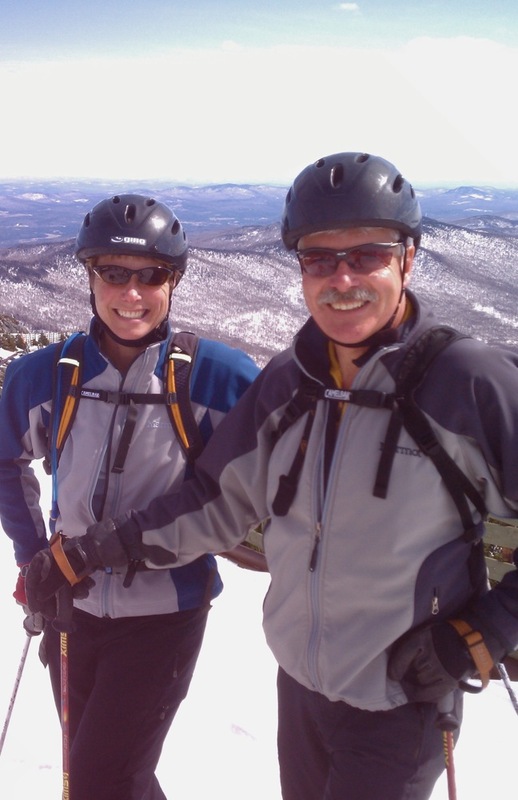 The father used to be a ski instructor at Platty, but now works in DC. And then there’s Cosmo. We ran into him and saw him at least half a dozen times. Anyone who skis Plattekill knows Cosmo, always wearing the jersey of his beloved team: the Jets. Even on the coldest days, he’s never layered up beyond what that oversized jersey can handle. He is always the last one up the chair before the patrol, and I’m sure he was at Jay too. A couple stopped me noticing my Plattekill logo. Kirby and Martha and follow NYSkiBlog, and had seen our post from Friday. The whole experience was sweet, so many skiers saying hello, meeting some great people, very nice staff, and even the occasional shout-out we heard from people yelling “Yeah Plattekill!” and “Plattekill rocks!” We didn’t know if they knew who we were — it could have been the logos on all our gear. I guess that product placement works. It’s been a long time since I skied Jay. A lot has changed, definitely for the better. They’ve done a great job mixing the old with the new, and not forgetting to pay homage to the history of Jay in everything they are doing. I love the tower bar tables made of old lift towers, and the bar rail and door handles made of the old lift cable. I’ll be copying some of those designs — that is the best form of flattery. We left late in the day and drove through a border patrol checkpoint on I-87 that slowed us down a bit. We smiled at the female officer with the glock strapped to her waist and she waved us through. We stopped in Lake George for dinner and arrived home in Roxbury around midnight. This was a great trip. I can’t wait to return, although its hard to say when we’ll make it back. In this business, you can’t really ski other mountains in your prime season. When I do get a little time off, Jay is where I’ll choose to go. Danielle was hinting on Thursday that she would rather have been at the beach when it was blowing sideways and snowing with a mid-winter fervor. But Friday’s cloudless powder blue-sky day made up for that, and we all went home with a nice winter tan. I must say though, that blue sky was not quite the same as that famous Plattekill blue sky we love. 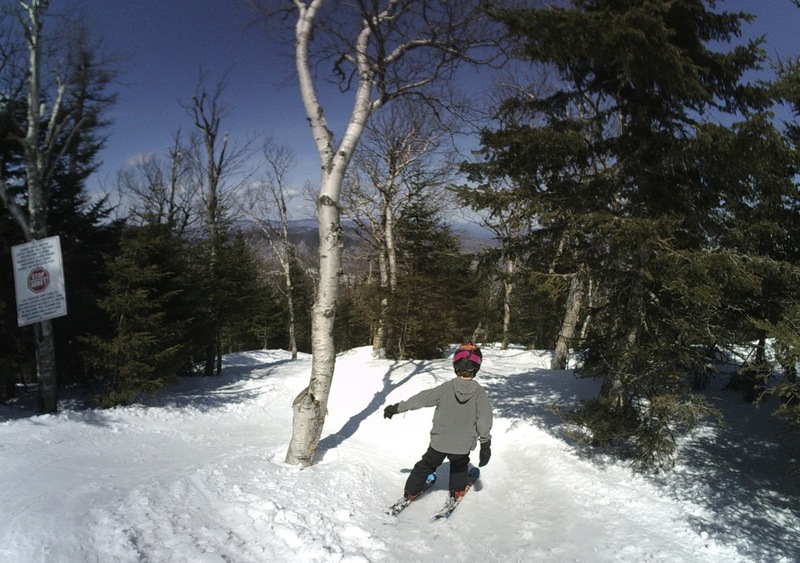 Nevertheless, the skiing was amazing and the vertical is the best, and that’s coming from a guy with a steep home mountain Plattekill… err, Little Jay. Laszlo. It’s great to see a ski area operator being so honest and open about this business, his area, other areas, etc, which leads to a question for Harvey: what the heck every happened to Conversations with Mike and Emily? Why has Gore management gone so silent this past season? Just wonderin…..
Nice report. Just bummed I didn’t get to meet Laz. Hope to someday. Look forward to his return and hearing big things about Plattekill. @Steve – Hoping to put together another late season pilgrimage to Jay with Laszlo and the team soon. We’ll make sure we do it when you are in the house. That’s a great few days of blogging. Thanks for your thoughts, can’t wait to see you back on the mountain in the Catskills this winter.